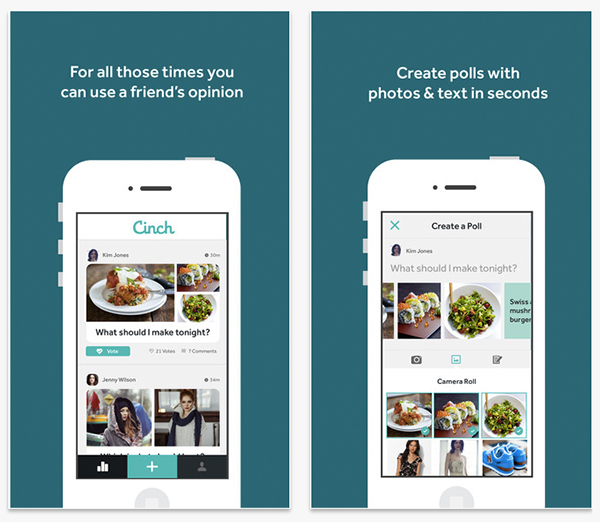 A new, easy polling app lets users write a question, attach pictures and get opinions. Which shoes go with this dress? Which stock photo works better with this headline? Which selfie should go on my Tinder profile? 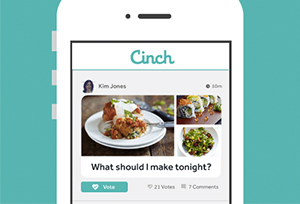 The answer to these questions and more awaits you with Cinch, a new app that lets you design quick polls with images and send them out for your friends to vote on. The Cinch interface is, you guessed it, a cinch to use. You type in your question, select photos or screenshots from your camera roll, and put your poll up for a vote. Unlike other polling apps like Your Call or Voice Polls, your polls aren’t posted to a website or straight to the wilds of social media. Instead, you pick the friends you want to weigh in from your contacts and manage who can see, respond and comment on your poll. Your contacts don’t need to have Cinch to use it. Those who have the app will get incoming polls as a push notification, but others will just get an SMS text. It’s worth noting that app users can see the results, but only after they have voted themselves. Frankly, this is our favorite kind of app because it sounds totally ridiculous until you realize just how useful it could be for planning an event or collaborating on group project. No more 100 character links or giant image files, just ask a question and get an answer? We vote yes.